Teleosts include more than half of the verte-brate species (Baldacci et al, 2001; Wekkawy and Osman, 2006). A key feature of teleost evolutio-nary success is their reproductive system, which must be functional in all aquatic environmental conditions. 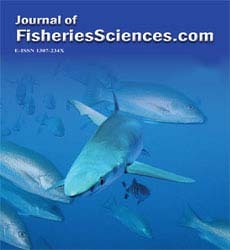 Much of the existing knowledge of the mechanisms involved in teleost fertilization is based on a few small model species such as ze-brafish, medaka and bitterling, which have no real commercial value (Coward et al, 2002; Wekkawy and Osman, 2006). The Zona radiata in fish oocyte has three different sequential lay-ers, including the oocyte plasma membrane or oolemma in the inner side, the Zona radiata in the middle and the follicle epithelium in the outer side. In developed follicle, the granulose layer and the theca layer form in the inner side and in the outer side, respectively. The Zona radiata has various functions. The nourishment of theca layer, of granulose layer, and of embryo and oo-cytes at their development phase takes place through the Zona radiata. It is also responsible for producing and secreting enzymes that hold a place in the re-ordering of certain layers of ovule membranes and/or in the digesting, the lyses, of the cell residues which are required to be cleaned at the end of the apoptosis, the programmed death. It also plays a significant role in the tran-sition of small molecules to oocytes through con-nection routes and in the synthesis of membrane elements in some fish types (Selman and Wallace, 1989). The term of Zona radiata is used to mean vitellin membrane, chorion, chorionic vitellin membrane, and Zona pellucida in many books (Hosokowa, 1995). The Zona radiata em-bracing ovule is generally in an extra-cell matrix form with the permeable canals formed by inner cell layer of follicle epithelium and oocyte mi-crovillus. This layer is composed of two sub-lay-ers which have distinctive structural features in different fish. The inner layer is similar to the Zona pellucida in mammals and is composed of various carbohydrates and proteins. The task of this layer in embryonic development and fertili-zation is to protect the ovule. The outer side has a peculiar macro molecular structure that helps in-teraction between its own watery surrounding and ovule, and that rarely includes sulfate poly-saccharide, carboxylate and glycoprotein (Guraya, 1986; Selman and Wallace, 1989). With thin structure analyses, it was demonstrated that the Zona radiata forms in the pre-vitellogenic phase . In this study, the formation of Zona ra-diata during ooctid development in an osseous fish- the zebrafish- was examined, and the col-lected data were compared to the related litera-ture. We describe here the fine structure of the envelope of the oocyte of the zebrafish. The ovary samples, which had been fixed in Bouin’s solution and % 10 Neutral Formaldehyde with tampon, were later treated in routine histo-logical processes and were sunk into paraffin. The sections in 6-7 μm diameters were colored through PAS method so as to examine under light microscope. The sections were illustrated by us-ing Olympus microscope and monitoring system. Pieces of the eggs were immediately fixed by immersion in 2.5% glutaraldehyde in phosphate buffer for 24 h at 4°C. The specimens were washed in phosphate buffer for 1-3 h and then post-fixed in 1% osmium teraoxide for 2 h. The tissue pieces were placed in propylene oxide for 60 min, then in Epon 812. Tissues were sectioned 1 μm and stained to-luidine blue. Sections were examined under light microscope. Ultrathin sections were mounted in copper grids. Thin sections taken in about 0.5-0.7 μm were contrasted by using Uranil Acetate – Leaden Citrate. Later on, they were examined under transmission electron microscope (Jeol, 100) and their photographs were taken (Koç et. al., 2008). There is considerable variation in the nomen-clature used to describe the external membrane of teleost eggs. Commonly used terms for this outer covering include chorion, zona pellucide, radiate membrane, egg membrane, vitelline membrane, vitellin envelope, egg shell (Yamagami et al., 1992; Wekkawy and Osman, 2006). The oocytes located in zebrafish ovary in dif-ferent phases were examined at the same section (Figure 1). 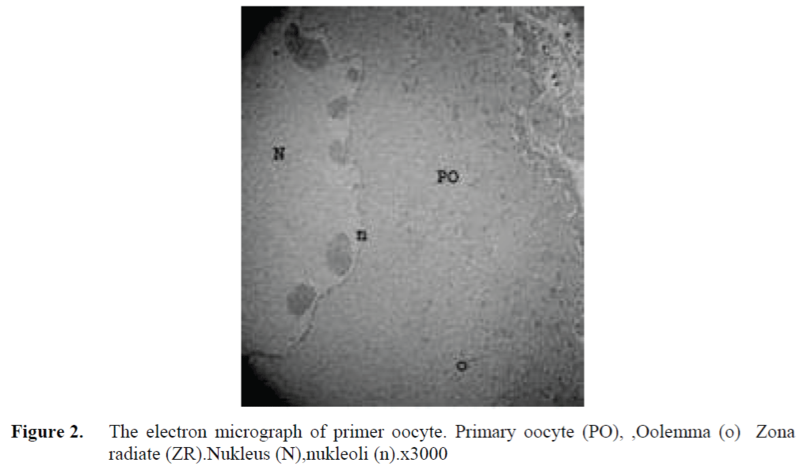 It was observed that primer oocytes are cells with oval nucleus having a few nucleoli (Figure 1. 2). In this phase, the nucleoli were cir-culated around the nucleus. In the first stage of growing up, the unchanged follicle layers were visible (Figure 2). The follicle diameters were small in this phase (Table 1, Figure 1). Flat folli-cular cell layer was delimited with a thick basal lamina. It was observed that theca layer is formed by fibroblast-like cells and many blood capilla-ries. Follicle layer was composed of flat cells with oval-shaped nucleuses. The nucleuses of oo-cytes in pre-vitellogenic phase were at centered position. In respect of light microscope data, the nucleoli seemed to be close to nuclear membrane (Figure 1). In vitellogenic phase, the size of oo-cytes escalated significantly. It was presumed that the first sign of the development of Zona ra-diata is the formation and taking shape of micro-villus structures. It was observed that microvillus groups take shape in the area between follicle cells and oocyte (Figure 4, 5, 6, 7, 8). In the early vitellogenic phase, small microvillus groups were seen in oocyte surface (Figure 4). Microvillus groups had directed towards follicle cells in an irregular manner throughout all development phases (Figure 4, 5, 6). It was observed that mi-crovillus groups have made connection with fol-licle cell surface by the progression of develop-mental phases (Figure 5, 6). The oocytes were much longer, bigger and more descent in the vi-tellogenic phase than they were at the beginning. This dimensional escalation was compatible with the nutrient accumulation in their cytoplasm. In this stage, it was observed that the thickness of the Zone radiata located between the ootid and follicle cells increased (Figure 1, 7). In the same stage, narrow and long spaces were observed on the Zona radiata (Figure 7, 8). These structures were comprised of microvillus groups lying reci-procally with each other between the oocyte sur-face and follicle cells. The follicle cells were ob-served with their cubic forms in this phase. Their nucleuses were big (Figure 5). Flat cells were seen in the theca layer. In this area, the shaped-blood cells were observed in flat fibroblasts and blood veins and lumens (Figure 6, 7). Fish egg blankets are very adaptable to the environmental conditions within which they de-velop. Fish develop complex and thick blankets to their surrounding conditions. The structures, components and developmental patterns of fol-licle barriers differ significantly according to fish types. The membrane in mammals which corres-ponds to the zona radiata is the zona pellucida. The zona pellucida is a rich membrane in glyco-saminoglycan and glycoprotein. The zona radiata is composed of mucopolysaccharide and glyco-protein. This membrane has characteristics of PAS-positive in fish and mammals. The vitellin envelope of teleosts is composed of 3 layers: Z1, Z2 and Z3 (Begovac and Wallace, 1989) also termed zona externa, interna and subinterna (Gil-lis et al. 1990). S. dumerili, during the matura-tion phase, the compacting of the vitelline envelope layers is apperent as the oocyte micro-villi disappear, although remnants of vitelline envelope pores can still be observed (Grau et all 1996). On the contrary, Kagawa (1981) reports the complete disappearance of the vitellin envelope pores in the yellowtail, Seriola quin-gueradiata at this stage. As is the case in nearly all teleost fish, the zona radiata began to develop firstly after primary phase in zebrafish. At this stage, it was observed that there are follicle cells cumulated on the surface of oocyte. The structure of the zona radiata was homogeneous during the development phases. It was seen that the zona radiata that located between the oocyte and fol-licle cells had thickened at the vitellogenic phase. Light microscopy showed that the zona radiata was striated in early vitellogenesis. A similar finding has been reported for Hemiodus spp. (Garcia-Diaz et al. 1997, Brandao et. al. 2003) found such striations during late vitelloge-nesis in Serranus cabrilla and Serranus atri-cauda. In the zona radiata of Liza aurata, each striated line represented a canal with pores opening at both ends. According to Shabanipour and Behroos (2004), zona radiata wans’t seen by light microscopy in the previtellogenic stage in Liza aurata . The zona radiata develop during the late stage of ovarian growth when vitellogenesis was about to end. 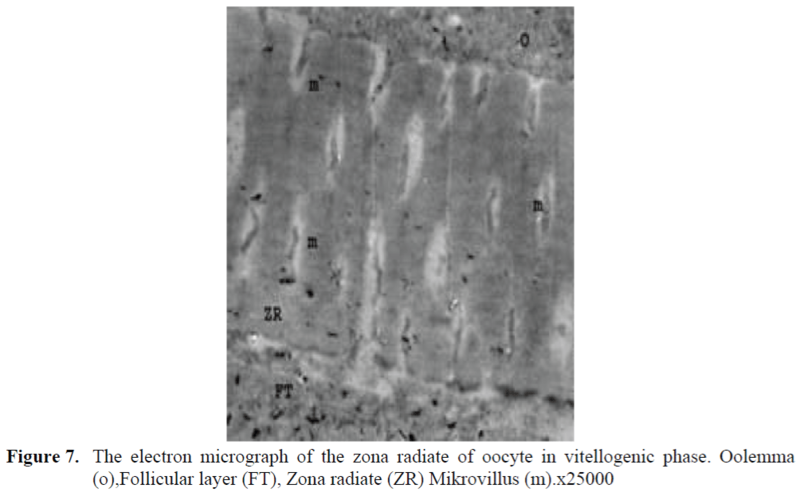 During development of the oo-cyte in Liza aurata, the zona radiate is extended as primitive projections towards the inner surface which became more prominent as vitellogenesis progressed. Abdalla and Cruz-Landim (2003) also observed a perforated zona radiata with pore canals in Piaractus mesopotamicus. 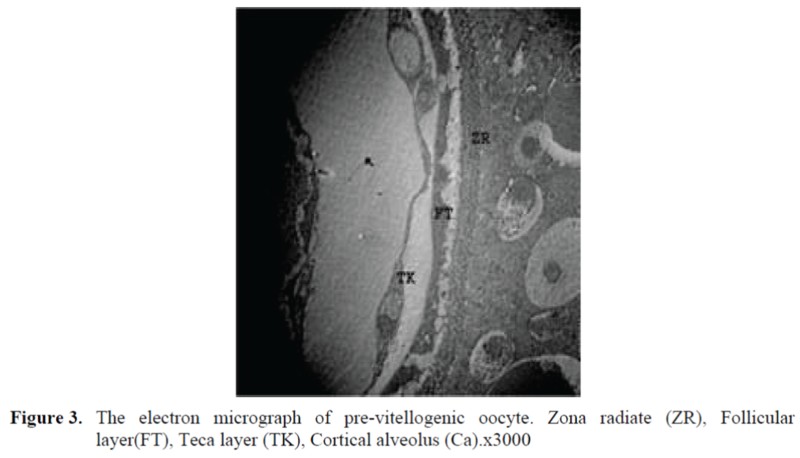 The micro-villus groups located on the Zona radiata of ze-brafish and lying from oocyte cell surface and follicle cells were observed in narrow and long spaces. These formations have been evaluated as the evidence to structure-function correspon-dence. The thin structure of the ovary follicles of zebrafish was found to be in accord with the thin structure of the ovary follicles of Lisa ramada (Isisag, 1996). In this study, the contributions of microvillus structures of follicle and theca cells to the formation of zona radiata were demon-strated accurately. As is observed in teleost fish in general and in zebrafish in particular, it was seen that as oocyte grows, the number of follicle cells has risen through mitosis and there has been a continuous follicle epithelium formation (Guraya, 1986). It was described that as is the case zebrafish, the zona radiata has formed at the further phases of development in Fundulus hete-roclitus, and the zona radiata is composed of two layers, which are zona radiata internal and zona radiata external (Cerda et al. 1996). In teleost fish, a rapid thickening process is observed in the zona radiata during maturation and ovulation stages (Selman and Wallace, 1989). Accordingly, an obvious thickening process was seen in the zona radiata of zebrafish when the oocyte was growing. It was also supported by Guraya (1986) that the thickening tendency of the zona radiate in fish during oogenesis is caused by the rise in the ovule diameter and it lessens after ovulation. The main microscopic difference observed among the three species of Hemiodus was the thickness of the zona radiata layer of the oocyte. The grooves of the zona radiata observed in Hemiodus ternetzi, were pores or channels filled by filaments of the oocyte and of the follicular epithelium that could also be related to adhesiveness (Guraya, 1986). According to Li et al (2000) the ultrastructure of the zona radiata surface, the distribution density of pores and the size of eggs were also useful characters for distinguishing among the four species (Mugil cephalus, Epinephelus malabaricus, Epinephelus coioides, Sciaenops ocellatus), but the ultrastructural features of the micropyles were the most important of all for egg identification. A group of researchers found that the zona radiata is homogenous at the first phases of growing and the vitellin membrane has been composed of three different layers, which are Z1, Z2 and Z3, in the further phases (Begovac and Wallace, 1988; Selaman and Wallace, 1989]. It was found that the growing process of vitellin membrane in Novadan modestus (black scraper) is very much similar to the case in teleost fish and this mem-brane is comprised of three different layers hav-ing a fibril structure internally (Hosokawa,1985). According to Schmehl and Graham (1987), the zona radiata in Oncorhynchus tshawytscha, chum salmon (O. kisutch), pink salmon (O. gorbuscha), brown trout (Salmo trutta), rainbow trout (Salmo gairdneri) and lake trout (Salvelinus namaycush) examined consisted of an outer adhesive coating, a thin densely staining zona radiata externa with pore canal plugs and a thick, fibrous zona radiata interna with a fibrous network on the inner surface. There was a two layer adhesive coating over the zona radiata externa in all species except pink salmon in which only one layer was observed. There were structural differences among species in the adhesive layer, zona radiata externa and plugs in the pore-canal openings. It was explained that the Zona radiata internal gets a fibril and complex structure in teleost fish, when the oocyte is growing (Kobayashi, 1985; Koya et al., 1995; Selman and Wallace, 1989). In zebrafish, during further growth of the oocyte and vitellogenesis, the zona radiata played an increasing role in the transport of material required for yolk synthesis. Ultrastructural analysis has shown that the zona radiata is formed during the early vitellogenic stage. The zona radiata is extended as primitive projections towards the inner surface. These structural changes in the ZR were correlated with the appearance of primitive projections that later extended as finger-like structures. This structural change resulted in an increase in surface area and agreed with the importance of the ZR in transporting the material necessary for production yolk during vitellogenesis. Abdalla, F.C., Cruz-Landim, C.D., (2003). Some histological and ultrastructural aspects of oogenesis in Piaractus mesopotamicus Holmberg, 1887 (Teleostei), Brazilian. Journal of Morphology, 20: 3-10. Begovac, P., Wallace, R., (1988). Stages of oocyte development in the pipefish Syngnathus scovelli, Journal of Morphology, 197: 353-369. Cerda, J., Camlan, B.G., La Fleur, G. J., Limes, S., (1996). Pattern of vitellogenesis and follicle maturational compentence during the ovarian follicular cycle of Fundulus heteroclitus, General and Comparative Endocrinology, 103: 24-35. Gillis, D.J., Mekeown, B.A., Hay, D.E., (1990). Ultrastructural observations on the ovary and eggs and the development of egg adhesion in pacific herring (Clapea harengus pallasi), Canadian Journal of Fisheries Aquatic Science, 47: 1495-1504. Grau, A., Crespo, S., Riera, F., Pou, S., Sarasquete, M.C., (1996). Oogenesis in the amberjack Seriola dumerili Risso, 1810. An histological, histochemical and ultrastruc-tural study of oocyte development, Scientia Marina, 60(2-3): 391-406. Guraya, S.S., (1986). The celland molecular biology od fish oogenesis. 1-223 p.
Hosokawa, K., (1985). Electron microscopic observation of chorion formation in the teleost, Navodan modestus, Zoological Science, 2(4): 513-522. Isisag, S., (1996). Before ovulation follicular structures in ovaries of Liza ramada Risso (1826) (Mugilidae, Teleostei), Journal of Fisheries and Aquatic Sciences, 13: 3-4. Kobayashi, W., (1985). Communications of oocyte-granulosa cells in the chum salmon ovary detected by transmission electron microscopy, Development Growth-Differentiation, 27(5): 553-561. Koya, Y., Munehara, H., Takano, K., (1995). Formation of the adhesive material on masked greenling, Hexagrammus octogrammus, Japan. Journal of Ichtyology, 42(1): 45-52. Li, Y. H., Wu, C.C., Yang, J.S., (2000).Comparative ultrastructural studies of the zona radiata of marine fish eggs in three genera in Perciformes. Journal of Fish Biology, 56 (3):615-621. Selman, K., Wallace, R., (1989). Cellular and dynamic aspects in oocyte growth in teleosts, Zool.Sci., 6: 211-231. Shabanipour, N., Behroos, H., (2004). A histological study of the zona radiata during late oocyte developmental stages in the Caspian Sea Mugilid, Liza aurata (Risso, 1810), Brazilian Journal of Morphology, 21(4): 191-195.